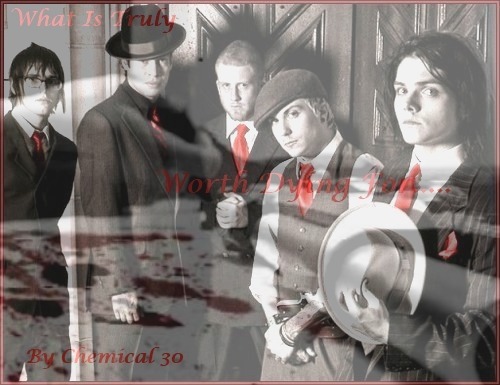 Discussion in 'Fan Fiction' started by Chemical 30, Dec 29, 2011. Summary: Mikey Way is forced into a life he once despised. The story is going to start on December 24, 1932. This is in the peak of The Great Depression. Donna Way was fast asleep when she heard someone banging feverishly on the front door. She glanced over at her husband, Donald, who was still sound asleep. Donna shook her head hoping that the knocking would stop, that they’d just go away but the knocking only grew louder and louder. She knew that this would happen eventually; they lived to dangerous of a life for it not to. “Donald there’s someone at the door.” Donna whispered. Donald sat straight up and listened to the thunderous knocks on the door. He got out of his bed and threw on a robe over his nightgown. “Stay here, no matter what you hear do not come down stairs.” Donald hissed before leaving the room. He grabbed one of his many guns from the cupboard and walked up to the front door. Donald felt a fist collide with his face, and he fell to the floor. The gun that he had been holding slid across the wooden floor. The unknown intruder grabbed Donald by his hair and forced him to his knees. Donald heard the click of a gun. “Just please let my wife live. She doesn’t need to die. Please.” Donald’s voice was shaky. “Not one person in your family deserves to live; too much blood is on your families hands.” The man growled and pulled the trigger. Young Mikey Way stretched his tired arms as he yawned. He locked the front door of the small bookshop that he owned. This year had been tough on him; of course it had been tough on everyone. Mikey was lucky enough to still have a job. Many stores had closed down these past couple years, but not his book store, strangely he was able to rent each month and he hadn’t fallen behind. He’d come close a couple times but was always able to scrape by. The gas street lights dimly lit the stone sidewalk. He could barely see his own feet. The bitter winter air cut through Mikey like a knife, he rubbed his two hands together and blew into them, trying to keep them warm. His breath was visible and he felt a chill run down his spine. “I really need a new coat” Mikey thought to himself. As much as he loved the one he had, it had patched up holes on the elbows and one of the pockets was ripped off. Finally he made it to his small one bedroom house, it wasn’t much but it was what Mikey called home. He hung his coat on the rack by the door, and went into the kitchen to make something for dinner. Mikey heard the soft sound of carolers down the street; he had completely forgotten that it was Christmas Eve. Mikey remembered when he was young him and his older brother, Gerard, would try to wait up for Santa Clause, but would always fall asleep before he’d come. Their parent always gave them two dollars to buy whatever they wanted; and “Santa” would bring them each a new toy. Mikey shook his head, he hadn’t spoke to or seen any of his family for close to four years. Not since they had thrown him out of the house for not joining the family business. Mikey wanted nothing to do with it, he didn’t believe in it in the slightest. His father had been so upset when Mikey said he didn’t want to follow his footsteps, he’d never forget the words Donald had said to him. He never did come back, despite the numerous pleads from his brother or mother. Mikey doubted he’d ever be able to forgive his father, and he knew his father would never love him again. Mikey grunted, and started the stove to make some soup for dinner. He flipped through the newspaper as he waited for the water to boil. Mikey heard numerous taps on the door; he furrowed his brows and set down the paper. He got up and slowly walked over to the door. He opened it slowly and someone quickly rushed past him and into his home. “Mikey…Mikey have the police contacted you yet?” Mikey knew the voice very well. Gerard. “No, why…what happened?” Mikey asked, severely confused. “It’s our parent’s…..they’re….they’re gone.” Gerard reported solemnly. Mikey stumbled into the closest chair with sudden distress. He didn’t know what to feel, one side of him hated his father, however, on the other hand they were his parents; they raised him, cared for him, and no matter the differences between them he still loved them. Mikey tried to form words, to say anything, but nothing escaped his lips. “I know this will come to as a shock to you but there’s something I need to talk to you about” Gerard stated. Mikey looked up at his older brother. He’d expected tears, weeping; anything to show some compassion, but there was nothing. Let me try to find the right words to express how in love with this I am already. I can't wait for the next chapter or any of this. It's addicting as hell and it's only chapter one. How do you do it? Seriously? I'm jealous because I wish I could write like you. And once again, you've made me completely love Mikey! And I can't wait for more!! Wow, this is different. I don't think I've come across one set in the 30's before, brilliant idea. Love it and looking forward to the next chapter. “There are but that’s not the point, I want it to stay in the family. Father would want that too.” He stated looking his little brother in the eye, urging him to accept the offer. “Is that honestly what you believe? That father hated you? No….he loved you; of course he was upset that you didn’t follow in his steps but he never stopped loving you.” Gerard said. “Then why didn’t he come over? Why didn’t he visit my shop? Gerard, he didn’t care about me one way or the other.” Mikey growled his voice rising above normal. “Why didn’t you come over for the holidays? Why didn’t you stop by the house on his birthday? Both of you were too prideful to admit your mistakes. Please Mikey come back do what you were born into; instead of living day to day with that small book shop that won’t get you anywhere. Mikey this will make you someone, someone you’re grandchildren will be proud of, something father would’ve been proud of.” Gerard’s face was inches from Mikey’s now, his hands of his shoulders. “Gerard I don’t think this is a good idea. Find someone else.” Mikey sighs and stands back up. Gerard’s hands fall limply to his sides, a look of utter disappointment written on his face. “Can you just leave…please?” Mikey mumbled before walking over to the door and opening it. Mikey shut the door behind Gerard and locked it. He hadn’t realized that his hands had started to shake; his knees were weak and could no longer hold his weight. Mikey slid to the floor and put his head in his hands, he felt a sob rip through his chest. An overwhelming sense of grief and guilt engulfed him, he never was able to repair his relationship with his family and now he’d never be able to. Once Mikey gained control of himself he stood up and walked back into the kitchen. The water was now at a rolling boil; Mikey put in random vegetables and chicken stock, and waited for his soup to be completely done. He poured some of his dinner into a bowl and sat down at his small dining table, outside he could see small flakes of snow falling down leaving a sparkling layer of white on the ground and a group of six carolers singing softly to his next door neighbor. The how soup warmed his cold body, he’d finally got his hands to stop shaking. He could feel a light breeze coming in through the gap in the door, Mikey left himself a mental note to get that fixed; but he knew he wouldn’t have enough money to do it until at least next month. With a sudden burst of pride Mikey stood up and put his bowl in the sink before grabbing his coat and hat and stepping out into the cold. Gerard sunk into his red leather chair, his eyes felt heavy and if the door hadn’t have opened he would’ve fallen asleep. He looked up and saw a tall man with a lot of brown curly hair. He’d grown to become friends with this man. Gerard slowly stood up and hugged him. “Ray, I’m really glad you came. I was worried you wouldn’t with the storm.” Gerard greeted. “I’m guessing the Spaniards it couldn’t be the Irish, they wouldn’t break our truce.” Gerard stated. The door opened suddenly cutting Gerard off, and when he turned he saw the familiar slim body of his little brother. “Mikey what are you doing here?” Gerard asked confused. Mikey’s glasses were splattered with drops of water, and his hair dropped small beads of water on the wooden floor. “I-I came here about your offer.” Mikey stuttered. “Well…are you still looking for an underboss?” Mikey shrugged. I was going to bug you about this today, but now I don't have to because you updated Yess!! I love it! I love Mikey in this too I felt bad for him in this update. So he decided to join, huh? This is going to be interesting. AND! I love the banner!! It's perfect for this!! After Gerard had welcomed Mikey in, he insisted that his younger brother stay the night; stating that the weather was just too bad and that he’d have his driver take Mikey home later on the next day. Mikey agreed to spend the night, a hallow pit had formed in his stomach; he had agreed to the one thing he’d swore he would never do. Presently Gerard and Mikey sat by the fireplace trying to warm their cold bodies, Gerard was chatting about the family business and how happy he was that Mikey was finally involved. “Well you know my book shop…..will I have to sell it?” Mikey asked. “Most likely, it will be too dangerous for you to have such a public place running. I am sorry; I know how much that shop means to you.” Gerard sounded sympathetic. Mikey nodded solemnly, he’d have to inform Frank to begin looking for another job. Frank. Mikey hadn’t even thought of his best friend throughout all of this. Frank the one person who was there for him through thick and thin; his best friend. An idea slowly began to form in his mind. “Gerard can people outside of the families join the business?” Mikey asked. “Well I have a friend; he’s been working as my manager for about two years now. And now he’ll be out of work, I was thinking, if it’s okay with you, that we invite him into the business.” Mikey asked. The next morning Mikey set out for Frank’s house. Gerard had sent one of the associates to accompany Mikey stating that, “Now you need protection no matter where you go.” The young associate was a dark skinned, black haired Italian man named Hector. Mikey guessed he was about his age, if not younger. They were walking in unison; both matching each other’s strides. The air was cold and bitter, and the wind cut through Mikey’s skin like a knife. Hector was walking with his chin tucked against his chest trying to hide his face from the merciless wind. “So how long have you been a part of the business?” Mikey asked trying to spark a conversation. Hector looked at his feet his breath coming out as small white clouds. Mikey could see the similar white and brown house coming into view. He could feel his stomach churning; he was worried that Frank would refuse. Frank opened the door, donning a pair of black slacks and an open white dress shirt. He smiled once he saw his best friend but his demeanor quickly faded into confusion once he saw Hector standing crossed armed behind him. “Hey Mikes, what’s going on?” He grinned nervously. “There’s something I need to talk to you about.” Mikey stated calmly. Love the banner, love the writing and still stoked with the concept. Damn you're good! Hector gave a grateful smile, “Thank you sir,” he said and followed Mikey into the small house. Frank shut the door behind him and turned to face his friend who was nervously biting his lip. The inside of the house was no better than the outside, you could feel the soft breeze from outside, and the house was dimly lit by only a few lamps. The wooden floor boards creaked under anyone’s weight and you could hear the soft patter of rain hitting the tin roof. “Mikey are you okay? Is it the shop?” Frank asked as his heartbeat began to pound faster in his chest. Mikey looked at Frank, trying to think of the words he wanted to say, “Yes, I’m going to have to close it down.” He stated solemnly. “No, not at all,” Mikey answered his voice quivering. “Then why are you closing the shop?” Frank questioned his voice started to rise. “Did you come to tell me to start looking for another job?” Frank snapped. “I don’t know anything about your family actually, you’ve never told me about them.” Frank said. “I came to ask you if you wanted to be a part of it…..you would be my guard…along with Hector of course.” Mikey explained, he looked at Frank with pleading eyes. “I know…but I just thought I’d offer it to you first because I feel awful about closing the shop.” Mikey confessed. “Why must you close it anyway?” Frank asked. “It’d be unsafe to have such a public place open. Not only would I be putting myself in danger but also anyone who walked into it.” Mikey elucidated. “Alright I’m in,” Frank grinned. Love the banter between Frank and Mikey - it's so nice to have them as besties and so close but not in a Frikey. Hector frightens me a little. well hopefully Frank can buy himself a better house now, haha. Mikey left Frank’s house with a smile on his face thinking at least he wouldn’t have to do this thing completely on his own. Hector walked besides him quietly trying to find a place where the bitter cold wouldn’t completely numb his face; suddenly he remembered what Gerard had asked him to do before Mikey and he had left. “Please, call me Mikey….Sir seems too formal.” Mikey smiled at Hector and then continued to look straight ahead. “Your brother had asked me to take you into town; he also gave me some money.” Hector informed. “Why? What does he need in town?” Mikey asked stopping in his tracks, the brutal wind almost knocking him off his feet. Mikey looked down at his holey coat and thin white undershirt, his slacks were becoming worn at the knee and he could feel water leaking into his old boots. Mikey bit his lip and nodded knowing that he’d have to wear more formal attire since he now was the underboss. Hector turned towards the direction of the busy city and Mikey hurried to catch up with him. Few cars drove on the slick pavement, not many people owned cars and even fewer brought them out in the bad weather. The streets, however, were plenty busy with people carrying small packages in colorful bows… late presents for Christmas Mikey presumed. You can’t even tell we’re in a recession Mikey thought; he also thought about his shop, people would always buy from him because he sold the books for cheaper than any of the bigger stores did. Mikey smirked to himself, he remembered how happy he’d been after the first Christmas owning the shop, he had been so happy at how well he’d done. A hollow pit formed in his stomach when he realized he’d never have a Christmas at the book store again. Mikey looked up at the tailors shop, and sighed before walking into the warm store. “Mikey my boy!” Mr. Walkins, the tailor, greeted. Mr. Walkins was a middle-aged man, with graying brown hair, and large glasses. He also walked with a limp, a wound from the first World War; Mikey remembered feeling bad for the man when he had first seen him. “Hello Mr. Walkins,” Mikey smiled. “I’m almost done with that book I bought last week; I hope you have the next one in stock.” Mr. Walkins grinned. Mikey looked to Hector who stared at him with wide eyes, “Other things came up,” Mikey stated solemnly. “You got a call earlier for a fitting?” Mikey asked. “Yes yes, now I remember, come in back and we’ll get you sorted out.” Mr. Walkins said and turned to walk into the back room. Gerard sat at his desk looking over the plans for the delivery of a truck load of alcohol that night. This illegal bar, or speakeasies as the people had come to call them, that they were delivering to have been a regular customer since the prohibition had started. But this was the first delivery Gerard would make as the boss of the mob; he had to make sure everything would go smoothly. Just as he was about to finish with the first look over he was interrupted by a knock on the door. “Who is it?” Gerard shouted. “Ray,” Spoke the voice behind the door. “Come in,” Gerard mumbled and the door opened quickly and then shut just as fast. Ray walked up to the desk and waited until Gerard spoke again. “What is it Ray?” Gerard asked running a hand through his hair. “Gerard as your Consigliere; I think you should’ve talked to me about inviting your brother into the business before you actually did.” Ray stated. “But he knows absolutely nothing when it comes to being in this business, he’ll hold us down.” Ray said firmly. “Ray I know you wanted to fill the spot of underboss when my father passed away but it’s in the past now. There is nothing I can do about it.” Gerard answered in a tone of authority. “This has nothing to do with that, it has to do with the wellness of this mob, you have a kid, not just a kid but a kid that’s basically worthless, running under you!” Ray growled. Gerard stood up, anger boiling in his chest. “You do not speak of my family like that! It was my decision as boss and my decision is final! I can have you killed for speaking like this to me. Now leave before I really lose my temper!” Gerard shouted. Ray was about to respond but decided against it, instead he turned around and stormed out of the room, the door slamming behind him. Gerard muttered something under his breath before sitting back down in his leather chair. Not only did he have the delivery to worry about but he also had his mother’s and father’s funeral to worry about. Gerard put his head in his hands and took a deep breath before going back to look through the plans. Was Ray right? By hiring Mikey was he truly bringing down his business the business his great-grandfather had fought so hard to start? Gerard groaned and grabbed a flask filled with whiskey; he brought it to his lips and took one drink before putting it back into his desk. He had the plans to finish. I'm liking Ray as the shafted underboss, it's really great to see him as a (potential) villan rather than the perenial nice guy. I'm feeling really torn for Mikey, what a change and a learning curve. Wow.. Ray. Mikey better watch out. Though Ray has a point. I'm curious to see how Mikey does with his position. New reader and wow! Very interesting story!! Once Mikey and Hector returned home, Gerard asked Mikey to join him for dinner. Mikey didn’t refuse; they ate at a long table in front of the fireplace. Mikey was carving into his ham when Gerard spoke up. “Since, I assume you’re going to be living here, you are going to follow the same guidelines as everyone else that resides here.” Gerard spoke with a tone of authority. putting a forkful of ham into his mouth. “Yeah I got that.” Mikey lied, also filling his mouth with the flavorful meat. “You’re going to have to borrow one of my suits for you to wear tomorrow; hopefully yours will arrive by Monday.” Gerard mumbled the last part to himself. Mikey blushed and looked down, suddenly he felt very self-conscious about this appearance. Not a word was said the duration of the rest of the meal. Gerard excused himself saying that he had business to attend to, Mikey finished up his dinner and took both his and Gerard’s plate into the kitchen, once he stepped into the kitchen one of the maid gasped. “Oh sir, I didn’t realize that you and Mr. Way were finished. Here let me take those from you.” She grabbed the plates, and hurried over to the sink. “No worries, I don’t mind,” Mikey stated, looking at the young girl. She had thick brown hair, big brown eyes and she had a small build. She only reached to Mikey’s chest. “Yeah, I just moved in last night, I’m Mikey.” Mikey stretched out his hand to her. “I’m Jamia, Jamia Nestor, nice to meet you.” She took Mikey’s hand and shook it gently. Mikey heard a loud crash and many feet stomping around. Suddenly two men carried in a third who was bleeding profusely. “Jamia he was shot! He is coughing up blood!” One of the men shouted. “Here put him on the table,” Jamia ordered clearing off the long table Mikey and Gerard were previously eating. Mikey looked down at the injured man, he looked to be in his late twenties, with short blond hair, his face was contorted in pain, and his shirt was soaked in blood. Jimmy, who Mikey presumed was the man laying on the table, started coughing wildly, blood splattering on Jamia’s face and dress. “Mikey can you go into the kitchen and fetch me a cold and warm towel, and two sharp knives?” Jamia asked. Mikey ran into the kitchen, he had no idea where anything was, and the kitchen was very big. Mikey just started opening drawers until he found the needed supplies. He rushed back out into the room where Jamia was now removing Jimmy’s bloodied shirt. Mikey handed over the knives and cloths and took a step back. He watched as Jamia removed the two bullets, and pressed the cold towel against the wounds. Jimmy’s forehead was covered in a layer of sweat and he was struggling to breath. Mikey could tell that this man was going to die. Surely enough the man began to cough again, and suddenly he stopped, he also stopped breathing. Jamia began to perform CPR, but it was useless, Jimmy was gone. Jamia sighed and let her hand fall, one of the men began to cry and he shouted many curses, he also said something about how dare they take away both his mother and brother. Mikey’s stomach lurched and for a moment he believed he was going to vomit, but the feeling passed and faded into uneasiness. This was what he joined, he joined a life of murder, violence and loss. The worst part? Mikey thought, was that I just involved one of my dearest friends into it. Mikey wasn’t sure if he’d be able to ever forgive himself if Frank got injured or worse….killed. I really enjoyed this chapter. Very good read and well written, I liked the rise in action. Mikey woke up early the next morning, having hardly slept at all, he had purple circles under his eyes and he could barely pick up his own two feet. He was surprised when he saw a suit folded and ready for him in the bathroom, he couldn’t remember hearing anyone walk in. Mikey shook his head and stripped of his night clothes, he turned on the water and stepped into the shower. The warm water woke him up slightly, just enough so he’d be able to function throughout the day. Mikey reluctantly turned off the water and wrapped a towel around his slim waist. He began to dress for the day, after that he exited the bathroom and walked down the stairs. He was shocked to see Frank standing at the bottom of the stairs talking to Hector. “Frank? When did you get here?” Mikey asked walking up to the two. and Gerard walked down followed by Bob. Mikey glanced up at Ray who was glaring down at him; he shifted uncomfortably and looked away. “Shall we be going then?” Gerard asked breaking the silence. All of them nodded and followed Gerard out the door. Dark clouds covered the skies and rain was lightly hitting the pavement. They ended up taking two cars; Ray and Gerard in one and the rest in the other. The drive was short to the Catholic Church, about ten minutes, and by then the rain was coming down heavily soaking anyone and anything that happened to be outside. Everyone hurried inside and took their seats. Mikey sat in between Frank and Hector; the Priest stepped out and began the service. Mikey felt awkward, everyone else around him seemed to know the words to the creeds and songs by heart. Mikey had never been a church going person, when the rest of his family would go he’d claim to be feeling ill or have a lot of school work to finish, and now he regretted it. The Priest seemed to talk for what seemed like ages to Mikey, he could scarcely understand what he was being told and his eyes started to feel heavy. Frank had to bump him a couple of times to keep him from falling asleep completely. Finally the Priest dismissed the congregation and Mikey stood up, stretching his sore and tired limbs. The next few moments went by in a blur; Gerard introduced him to many people in such a short amount of time he didn’t even have time to look at the faces of the people he shook hands with. Shortly after they loaded back into the cars and drove away from the church, Mikey could feel a headache starting to form above his brow, he begun to rub it gently. “You okay?” Frank asked noticing the look of pain on Mikey’s face. “Yeah, I’m fine…just a small headache.” Mikey gave his friend a small reassuring smile. Frank gave him an apprehensive look but dropped the subject. Mikey could hear the pattering of rain on the top of the car and this sound began to relax him, Mikey let his eyes fall and sleep soon over took him. “...Mikey wake up!” Frank and Hector both shouted as Mikey snapped his eyes open. “How long had I been asleep?” Mikey asked. “About an hour, but we’ve arrived to the meeting.” Hector announced, Mikey nodded and stepped out of the car and walked behind Hector and Frank. They entered what appeared to be an Irish pub, it was loud and stunk of beer and man. Mikey crinkled his nose as they were lead into the back room. The room was full with about twenty men, Gerard called him over, and Mikey went over to him. “Mikey this is Alastar Simmons; he is the boss of the Irish mafia and a longtime friend of ours. Alastar this is my younger brother Michael.” Alastar held out his hand and Mikey shook it, Alastar was a burly man with thick reddish -brown hair and bright green eyes. “Nice to meet you,” Mikey nodded. “I can say the same,” Alastar stated. “Yeah, sorry about not telling you, I couldn’t seem to get the information to you.” Gerard stated and kissed Bandit’s forehead. Lindsay smiled slightly, “I think I’ll be going now, see you this weekend?” She asked Gerard. “Yes, this weekend.” Gerard nodded and kissed Lindsay quickly. “Too dangerous, and it’s really not a place to raise a little girl.” Gerard explained. Murmurs surrounded the room, and soon Alastar began to suggest his plan. Gerard liked every bit of it and he smiled when Alastar finished. “I like how you think Alastar, I really do.” Gerard grinned. “Probably just the stress of your first day,” Hector shrugged his shoulders and returned his attention back to the conversation Gerard and Alastar were having. Mikey hopped he wasn’t getting sick, he had to follow Gerard’s schedule. He didn’t want to know what would happen if he veered away from Gerard’s plans. Poor Mikey, what a baptism of fire for his first day. So glad that Gerard's keeping his little family safe and away from the action though. After the meeting all Mikey wanted to do was go home and go to bed, his headache was still pounding. Of course Gerard had other plans, he wanted to go downtown to the local Italian restaurant, and afterwards see a play, Child of Manhattan, which was still being shown at the Fulton Theater in New York City. The drive was long enough that Mikey was able to fall asleep again and his headache was only slightly pounding. Frank shook Mikey awake and they exited the car. “Busy first day huh?” Frank smirked. “Yeah, tomorrow will be worse.” Mikey stated with a small feeling of dread. laughed and Mikey punched him lightly on the arm. They entered the small family-owned business; Mikey could smell the sweet scent of marinara, meatballs and garlic bread. Gerard greeted the owner, a small olive-skinned man with thick-curly black hair and green eyes, in a foreign language Mikey could only guess was Italian. Gerard ushered the man over to Mikey and introduced him. “Leonzio this is my younger brother Mikey, Mikey this is Leonzio Moretti.” Mikey shook his hand; Mikey had to fight not to pull away from the man’s tight grasp. “Many thanks Gerard now would you and your men like to sit down?” Leonzio grabbed seven menus and led them to the back of the dining room. Within a few minutes everyone had ordered and was waiting for the food to arrive. Mikey looked up and saw that Ray was glaring at him again from across the table. Mikey looked away quickly and decided to start up a conversation with Hector. “Hector where’d you grow up again?” Mikey asked. “New York actually, my mother and father ran a bakery just a few blocks away from here.” Hector answered. “How’d you end up in the Mafia then?” Mikey was interested now. “Um…my parents were both murdered about a year ago. They went on a walk and were robbed, apparently they didn’t have enough. They were both shot.” Hector breathed, Mikey felt his heart fall. “I’m sorry I…” Hector cut him off. Mikey nodded but didn’t speak. He didn’t know what to say really, luckily the food came and everyone started to eat. Dinner came and went and so did the play, Mikey didn’t pay much attention to it. He’d never been all that fond of plays or musicals; they never seemed to keep his interest for longer than a few minutes. They arrived at the house late that night, Mikey shuffled up to his room and slowly changed out of his brother’s suit, but before he could slip on his night clothes he walked over to the bed and collapsed into a deep sleep. The next morning came too quickly and Mikey, once again, had to drag himself out of the bed and into the bathroom. Just like yesterday Mikey found an old suit of Gerard’s folded on the marble counter. Mikey took a quick shower and got dressed; he rubbed his tired eyes before putting back on his glasses. Mikey walked into the kitchen and saw Frank talking to Jamia, she giggled at some joke he said before seeing Mikey walking in. “Oh, hello Mr. Way,” She stated trying to suppress her laughter. “Please call me Mikey, and you can laugh its okay.” Mikey smirked and poured a cup of coffee. “Would you like anything for breakfast Mikey?” Jamia asked almost forcing the word ‘Mikey’ out of her mouth. “Oh, no thank you, coffee is all I need.” Mikey sat down at the small table, but before he could put down his cup he remembered Jimmy, needless to say he stood back up and walked over to Frank. “Isn’t she something?” Frank smiled looking over at Jamia who was busying herself with the dishes. “Someone has taken up a fancy.” Mikey laughed and patted Frank on the shoulder. Frank shook it off but didn’t take his eyes off of Jamia. Mikey shook his head and took another sip of his coffee. “You two ready?” A deep voice asked behind them. and Mikey nodded and followed Bob down to the basement.